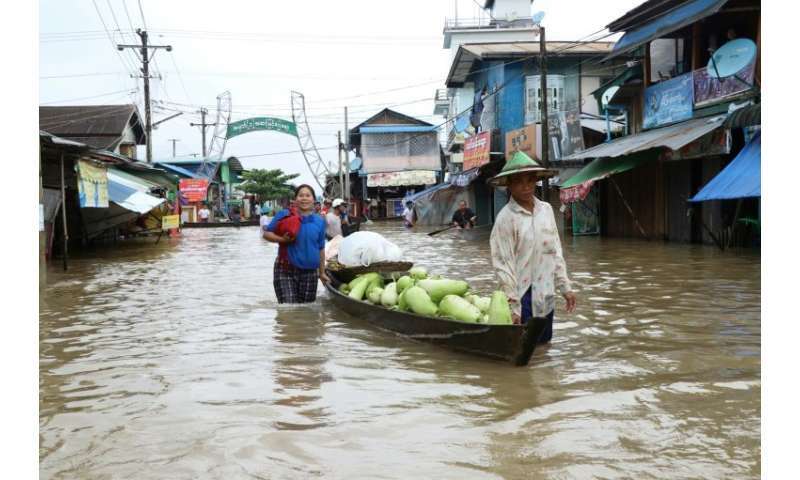 Photos and videos showed residents of Karen's state capital Hpa-an boating down streets that had turned into rivers while others were forced to escape on foot through waist-deep water. "There are more than 6000 people displaced in Hpa-an and about 4000 in Myawaddy," the head of Karen State police force Kyi Linn told AFP, referring to a second town on the border with Thailand. The number of affected in Mon State and Bago Region has not yet been confirmed. The Global New Light Of Myanmar said her government had freed up 200 million kyat (140,000 USD) to help those displaced and that rebuilding destroyed bridges would be a priority. "We are now delivering food to flood victims who don't want to leave their homes," said volunteer Ni Ni Aung in Kyonedoe town, adding they would have no choice but to leave if the rains worsened. Some 138,000 people were killed in 2008 when Cyclone Nargis lashed vast stretches of Myanmar's coast.